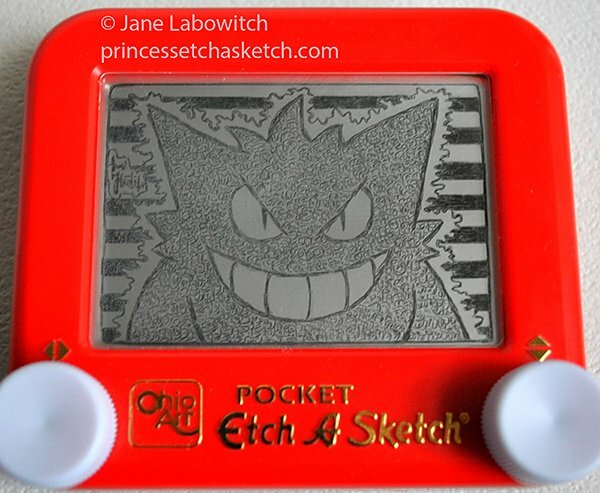 Curious to see what’s going on inside of your Etch A Sketch? 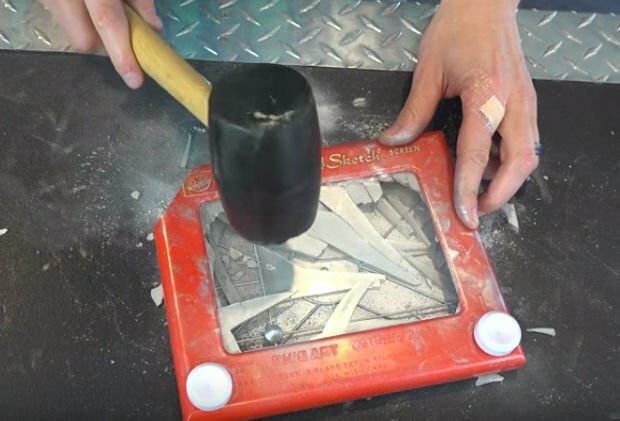 Curiosity is a good thing, but be warned, if you take apart that Etch A Sketch, you will have metal shavings everywhere, and probably fill your lungs with toxic dust. So you might want to enjoy this experiment from afar. YouTubers What’s Inside? and Grant Thompson wanted to know what the guts of the classic drawing toy looked like. So naturally they dissected some so we can all enjoy it. Turns out it is mostly very fine aluminum powder. This is what coats the glass screen and gives it that grey color. Aside from that, it is basically just the metal pointer, it’s position controlled by strings attached to the knobs. Moving the knobs scrapes the aluminum powder away, creating your drawing. Seriously, don’t do this at home. You will never clean up all of that metal powder. And your wife will kill you. And now for your moment of zen. This Etch a Sketch Zen Garden Coffee Table is a great way to channel your inner calm. Friend of Technabob Caleb Kraft created this fun project that combines a coffee table, an Etch a Sketch and a zen garden. It is a great piece of functional decor that you can play with while having your morning coffee..
Caleb’s goal was to create a table that would have two knobs to move a ball bearing through a bed of sand, sort of like a giant Etch a Sketch. He accomplished this by scaling up and tweaking a previous “tracing device” project. You can check out the build in the videos below if you want learn to make your own. It looks like a fun toy to have in your home. This would definitely impress your friends. To celebrate the 10th birthday of Arduino, the folks at laser cutter shop Just Add Sharks decided to make a laser cutter run by an Arduino Pro Mini. 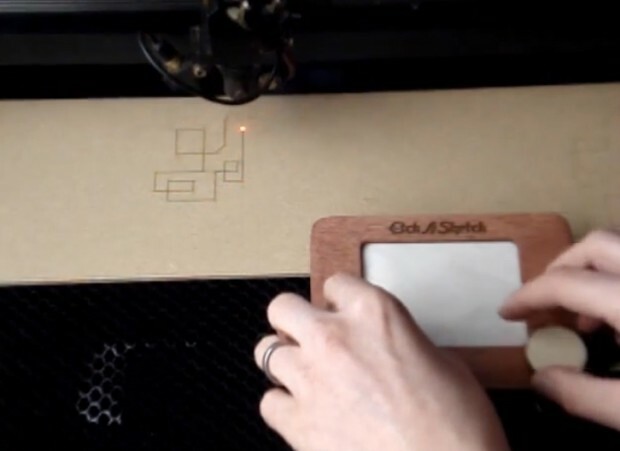 To make things more fun, they made it so their laser cutter is controlled using two knobs just like an Etch A Sketch. They even made the controller look just like the toy. 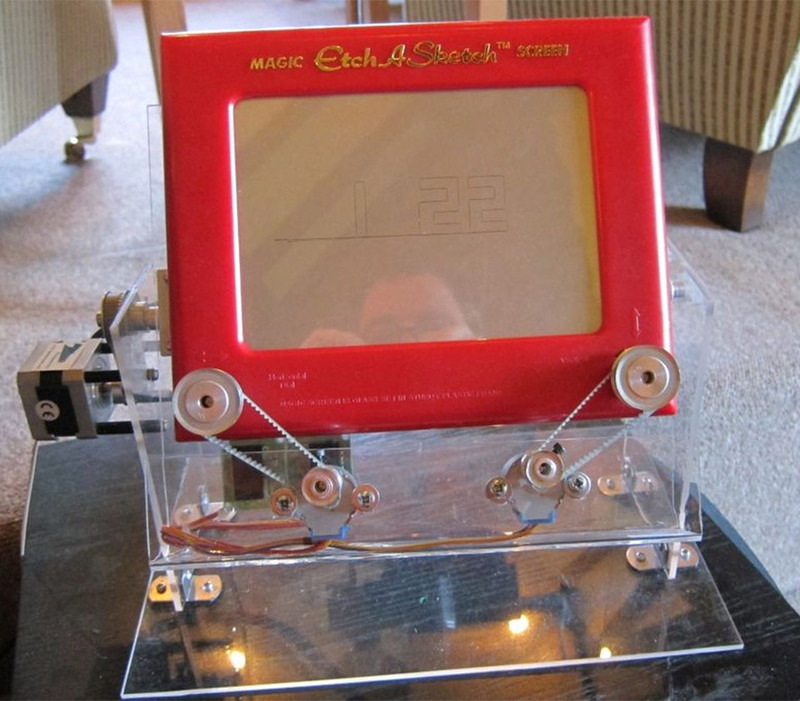 As with the Etch A Sketch, one of the knobs moves the laser vertically while the other makes it move horizontally. The laser cutter can not only etch, it also has a high powered mode that actually cuts through an object. That sounds awesome, but on the other hand you can’t erase or undo the process – no matter how hard you shake it. Turn the knobs on your browser and head to Just Add Sharks’ blog for more on the hack. 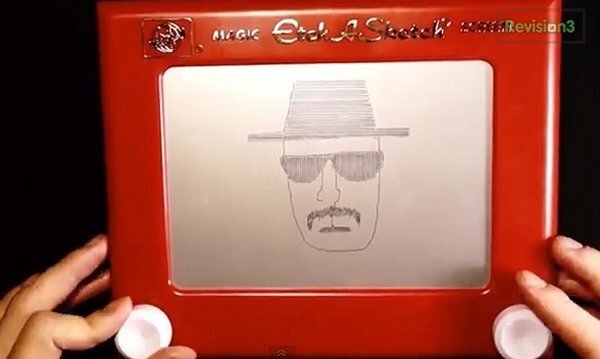 The Etch a Sketch has been used for many things in the past, but I think this is the first time that we have ever seen a TV show recap drawn out on one. 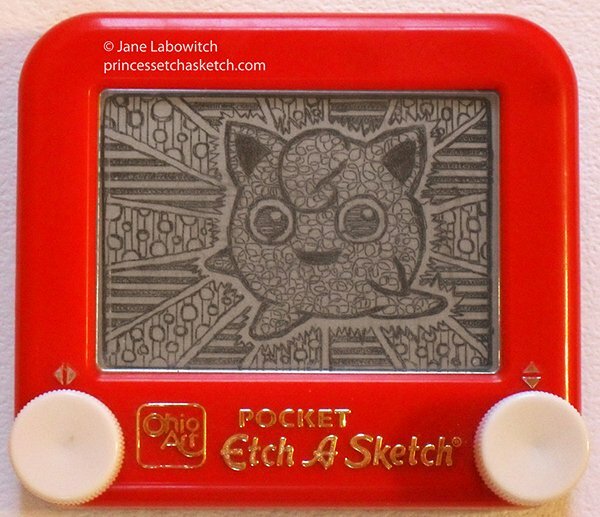 Hey, drawing on the Etch a Sketch sure beats cooking meth. 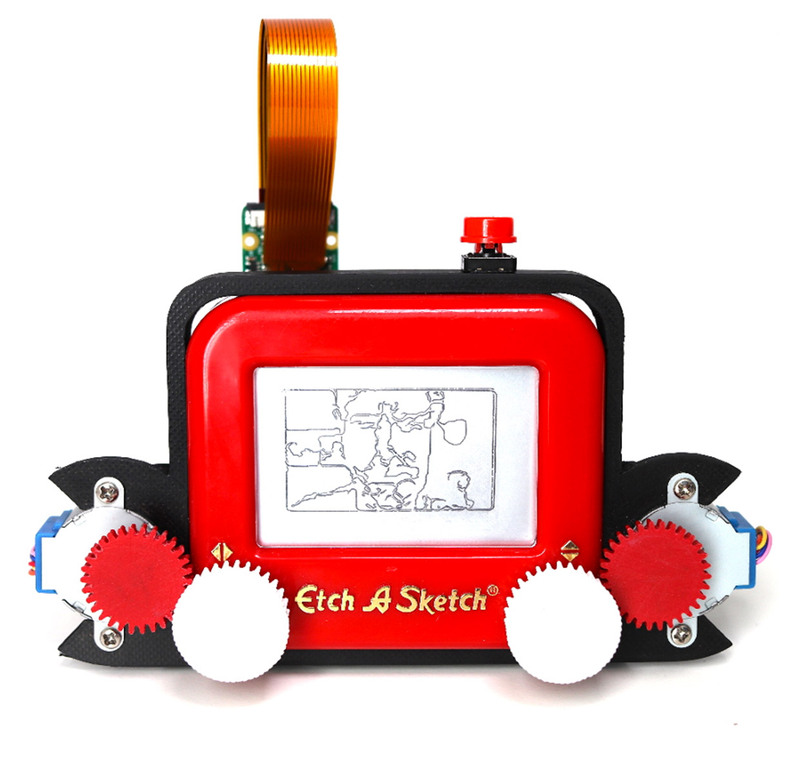 Todd’s Sketches is a web series that draws everything “from pop culture to news to whatever happens to be on his mind” using his Etch a Sketch. This is the premiere episode. Enjoy. When I was a kid, I never thought much of the Etch-A-Sketch. But a tool is only as good as the one using it. Did I just insult myself? 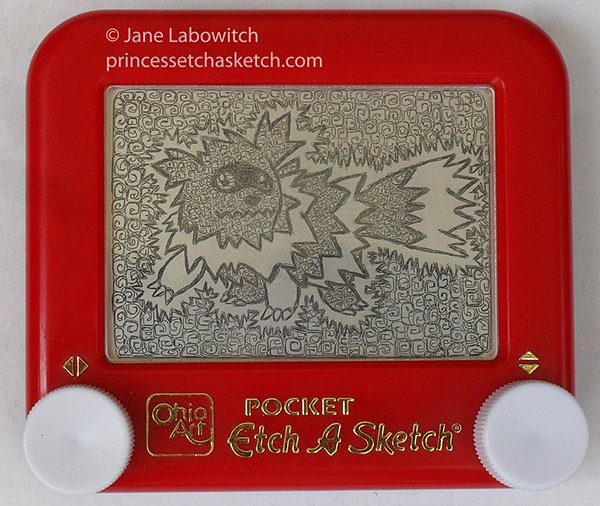 I think I just praised Jane Labowitch, who calls herself Princess Etch-A-Sketch. And for good reason. 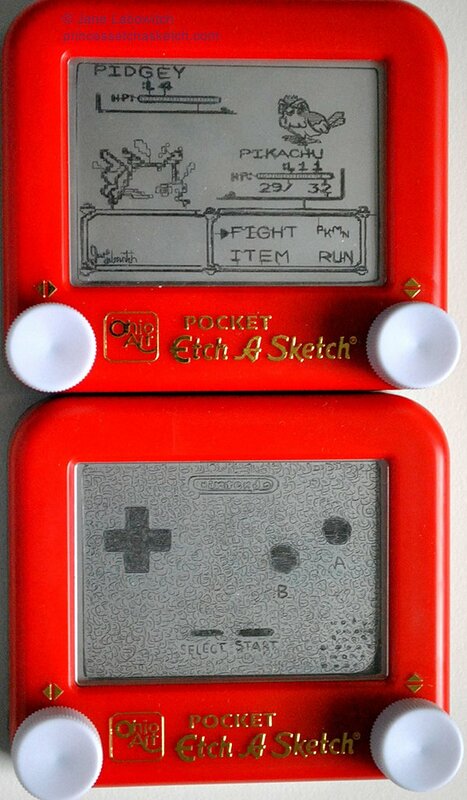 I wonder how long it would take to animate one battle sequence on an Etch-A-Sketch. Check out Jane’s deviantART page for more of her work, including her awesome business card. An artist’s talent is measured by the work itself more than the means that led to its creation… but in this case, we’ll admit being equally impressed by both. So when I saw this Playtime Belt Buckle on Etsy (aka the Etch-a-Sketch Belt Buckle), let me say I did more than just do a double take. While I’m not in the market for a new buckle, you might be. 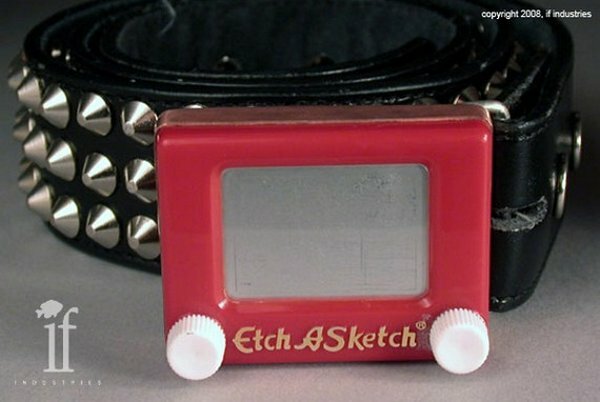 As its name obviously suggests, you can now wear a miniature and fully functional Etch-a-Sketch around your waist. It might be hard to draw stuff while you’re wearing it and it might be weird if someone else were using it to draw stuff while it’s around your waist, but hey, it’s still a pretty cool and funky belt buckle. The Playtime Belt Buckle is available from iFind Industries’ Etsy shop for $80 (USD). Of course with a hot glue gun and one of these, you could DIY one for a whole lot less money.